WATCH Biker STEAMROLL Through Anti-Trumpers Blocking Streets In Protest! This biker has just become my new hero…sorry Batman. No, but really, you just don’t see this too often. Typically all these hate driven anti-Trumpers are seen being an absolute inconvenience to everyone around them, without a care how it affects the lives of people whom have nothing to do with their hurt feelings. It just gets annoying right? But…this biker, wasn’t going to take their crap. He was on the road where he belonged and they didn’t, so he did what he had every right to do, and used…the…road. At least that’s what I heard…. Then a minute or so into that, you hear the biker before you see him…and boy is it a welcome sound because you start to see the protesters falling into a frenzy and getting all butthurt that he was obviously going to come through whether they were lying on the ground or not. Which DUH…roads are for driving, not for lying on. They really should protest on railroad tracks. Just kidding? 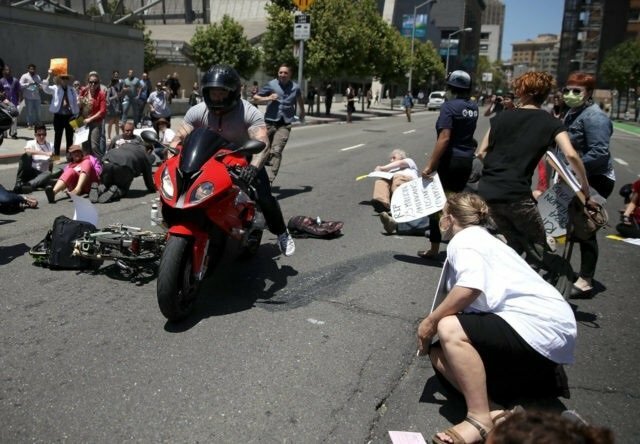 Anyhow, one of these anti-Trump protesters that were laying on the ground in the middle of a San Francisco street was delivered a rude awakening when the man on a red bike drove right through their demonstration. Here watch the video…and witness the mass panic this guy caused. Police asked the biker to stop before he could drive through the wall of people a second time. When the driver did not heed the officers’ calls to stop, one of the officers pulled out a gun and then arrested him, CBS San Francisco reported. Police say the charges are not determined yet and have not released the biker’s identity. Here is a statement from one of the snowflake protesters who sees no fault in themselves and how they were blocking the race causing a headache for everyone…but sees all fault in the biker. Nobody was injured in the incident, police say. The “die-in” in San Francisco was just one of a series of protests put on by anti-Trump protesters who oppose the Republican healthcare legislation known as the American Health Care Act that is moving through the Senate. On Capitol Hill in Washington, D.C., protesters also conducted a “die-in” outside Senate Majority Leader Mitch McConnell’s office Thursday. Many protesters were dragged out of the building for blocking the hallway to the office. Ridiculous that the biker had to get in trouble and the protesters got to block the road and do what they wanted. But hey…they are liberals. Liberals are fools who do not have the common sense to not lay in a roadway. Even most dogs are smarter than that.